Forward Ryan Bird says Newport County are capable of beating any side in League Two and is confident they can avoid relegation. 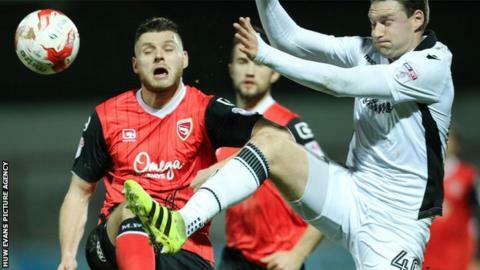 County moved off the bottom of the table and are now seven points from safety after a 1-0 win at Morecambe. Bird, 29, scored the second half penalty which secured victory. "We don't look at points, we just take it each game as it comes and if we keep winning every game in front of us then we'll be flying," Bird said. "The last two performances have been fantastic and we can beat anyone in this league if we perform like that. "When I came here that was my goal, to help Newport stay in the league." Newport were bottom and 11 points adrift when they sacked boss Graham Westley but have won their two games under caretaker manager Mike Flynn. "We had the belief anyway. The gaffer's given us the confidence to go out and play, express ourselves and enjoy it," Bird said. "We played well against a very good Morecambe side, a big strong side, away from home." Newport were awarded a penalty in the second half after Alex Whitmore fouled Alex Samuel. "I thought about it on the way here, thinking that if we get a penalty I'm going straight down the middle and that's what I did."